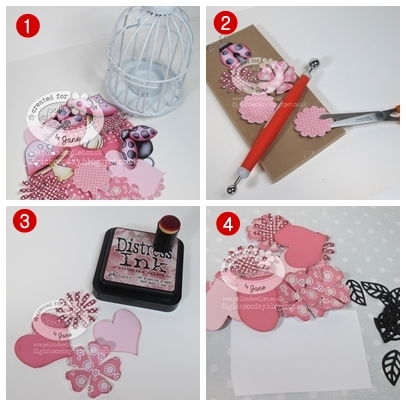 Paper, Pens and Pretty Things : Digi Choosday Challenge – Not a Card! Good morning! How are things? It is Choosday which means it’s time for a new challenge over at DIGI CHOOSDAY and our theme this time is Not a Card! As always we have a wonderful prize on offer for our lucky winner so check out the BLOG for details and as it is also DISCOUNT DAY you need to grab the code to get a MASSIVE reduction in the POLKADOODLES SHOP! But be quick, the offer is a 24 hour only deal!! This time I decided to decorate a little birdcage tea light holder that I picked up from Poundland! If only I could remember how much it was…lol! Here is a little photo montage to show you how I got this finished result. Pic 1: I printed out lots of pre-coloured goodies from Nikky's fabulous new LILY LOVE BUG COLLECTION and decided what I wanted to use. Pic 2: I shaped and cut into some of the flowers and a love bug (which I didn't use J). Pic 3: I inked the edges of the hearts and flowers with Victorian Velvet DI. Pic 4: Taking some scrap paper and additional die-cut leaves I arranged my elements …. Pic 5: ……. sticking them to the paper when I was happy. Then out came the glue gun and I stuck my arrangement (and an extra little love bug) to the birdcage, attaching a bow on top with a jump ring. Lastly I placed the cage on a circle of paper to give it a base. And there you have it! So don’t cage your enthusiasm and buzz over to THE BLOG and join in with our fab challenge. And don’t forget to visit the STORE as it’s…. Wow this is stunning love it. Fantastic tutorial as well. Such a cute project Jane. I love the colours and detail. Such a pretty make and I think that the birdcage could possibly be the older sister to my baby one I used last week on my teacup make. I think it may have been a pound. Lol. Great use of the flowers. I know! Isn't it hard to take photos every step of the way?!? One gets so caught up in being creative, all of a sudden, you've forgotten to photograph about 3 steps of the process, and there's no going back. Jane, this is beautiful! Thanks for sharing it with us. A very unique creation! Thanks for sharing with Crafting from the Heart! Hi jane; very unusual project and very pretty! And since you use fab flowers and ribbon you're more than qualified for our current challenge ar Crafty Ribbons! Thanks for participating with us and welcome back! What a beautiful project! Thanks so much for participating in our Really Reasonable Ribbon Challenge. WOW!! This is incredible! WOW!!! Thanks for joining us at leinzlovetearbearschallenge.blogspot.com. Stunning project - just beautiful. Glad you joined us at Natalie and Amy's this month. Simply Stunning! Such a Beautiful Project! Thanks so much for playing along with us over at Leinzlove Tear Bears Challenge Blog! Have a Great Day! Your card is absolutely adorable. Thanks so much for playing along with us at Really Reasonable Ribbon. We appreciate your participation, and hope that you will join us tomorrow for our new challenge. Jane, this is really stunning!!! It feels like a real garden. Love those flowers and all the details you added. Beautiful, Jane and a fab tutorial too. With my DT hat on, thanks for joining us at Create and Inspire, Crafting With Friends and Creative Inspirations.